(January 13, 2015 -- Peabody, Mass.) JEOL USA and the University of California's Irvine Materials Research Institute (IMRI) have entered into a strategic partnership to create a premier electron microscopy and materials science research facility. The IMRI will serve as an interdisciplinary nexus for the study and development of new materials, enabling advances in solar cell, battery, semiconductor, biological science, and medical technologies. The IMRI is headed by Dr. Xiaoqing Pan, an internationally-recognized researcher in the physics of materials who joined the UC Irvine faculty in 2015 to lead the $20 million initiative. The new electron microscopy cluster, to be known as the JEOL Center for Nanoscale Solutions, will house JEOL's highest performing Transmission Electron Microscopes (TEM) for characterizing and analyzing materials to determine their potential for a myriad of advanced applications. This will be the first research lab in the Americas to install the newly-introduced JEOL Grand ARM, which exceeds atomic resolution boundaries for any commercially-available TEM today. 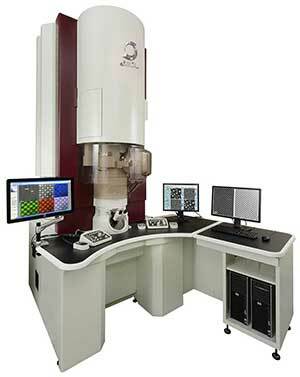 The Grand ARM offers 63 pm resolution at 300 keV for atom-by-atom characterization and chemical mapping. It features JEOL-proprietary spherical aberration correctors integrated in the image-forming system and illumination system, and an ultra-stable cold-cathode field emission electron gun. The center will also house the high throughput, nano-analysis JEM-2800 TEM/STEM, a versatile microscope favored for its ease of use while maintaining the highest level of performance. The JEM-2800 features dual large area Silicon Drift Detectors with unprecedented sensitivity for high throughput EDS analysis. Researchers will also utilize the cryogenic and atomic level structural analysis capabilities of the JEOL JEM-2100F TEM to examine biological materials, large molecules, and medical biopsy samples in efforts to improve delivery of pharmaceuticals to the human body. "The electron microscopy initiative and the IMRI at UC Irvine will provide new tools and great opportunities for potential collaborations with the many researchers on campus and in southern California,” said Pan. In his work he has pioneered the development of advanced functional materials and the characterization of their structure-property relationships at the atomic scale, which range from ceramics and semiconductors to biological materials and nanomaterials. "This foremost facility will be an important resource for some of the most renowned scientists in the world," said JEOL USA President Peter Genovese." With the installation of our flagship atomic resolution TEM, the JEOL Center for Nanoscale Solutions will be the most advanced electron microscopy cluster available for probing the atomic structure and properties of materials."